Winter has been wicked here. 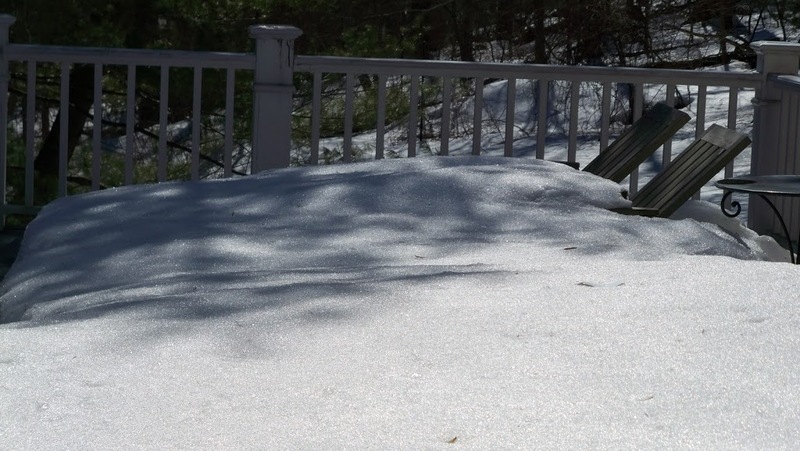 Today, March 2nd, my deck is still covered in a crusty snow. After a sinus and ear infection that literally knocked me off my feet with dizziness, a wild week of driving around New England in horrible weather seeing my two kids, and a weekend of college kids in the house, I am SO ready for SPRING!! I actually LOVE having my kids and their friends here. The college kids (really, young adults, but that idea makes me feel old(er)) are bright, personable, happy, energetic, ambitious, interesting…and encourage me to think our future is fine. bouquet of flowers on my front porch–a thank you from those wonderful kids! I rescued them from the freezing front porch and brought them in. and I knew the flowers would make a perfect centerpiece for a luncheon. Don’t worry, Mr. Fun, I bought these for a song. Is this a Baltimore Oriole? This bird’s plumage is similar to the colors in the coat of arms of Lord Baltimore, the governor of the Colony of Maryland. I would love to see some of these birds in my yard–I know there were some in Connecticut when I was little. I’ll add names to the place card holders when I have the final guest list for my luncheon. In the meantime, they are a nice reminder of SPRING! so the flowers would reflect in the surface. so I’ll keep my favorite bird book handy. our state bird, the American Robin. 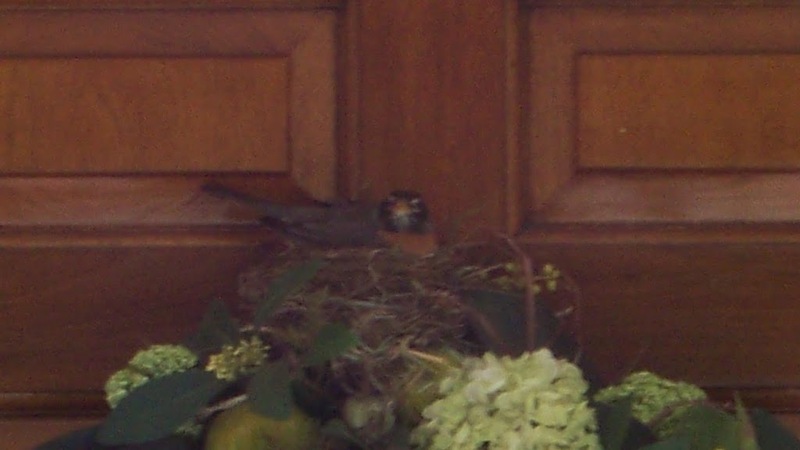 This one nested on my front door wreath last year. and the driveway is wet, not icy!! The flowers are just flat out gorgeous, and the table they inspired is equally so! I don’t know the identity of the bird since I’m pretty sure we don’t have any orioles around here. I do love to watch the birds, though, so love your plates. 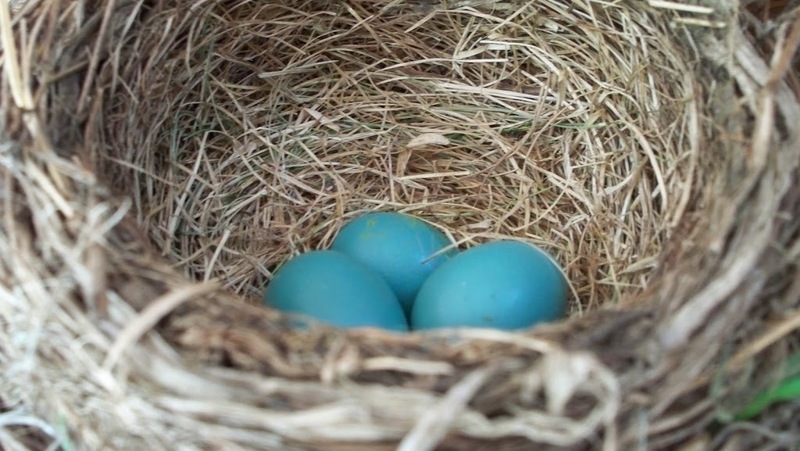 And those eggs in the nest are just gorgeous. I’d love to replicate that color for some faux ones for a nest I have. But don’t be envious. It all blooms and fades in about two weeks. Then, we just have heat. Hope you get to feeling better, and YES!, I love these flowers they are some kind of beautiful, and so is your tablescape.Spring has sprung inside, and it is sooo pretty, hope your snow is gone too. Lovely post and the flowers are gorgeous. Probably is a Baltimore Oriole. We have them in Maine. Very pretty table…the bouquet is so bright and cheery. I ♥ your salad plates…and those chargers are gorgeous. Robin’s egg blue is my second favorite color, right after green! 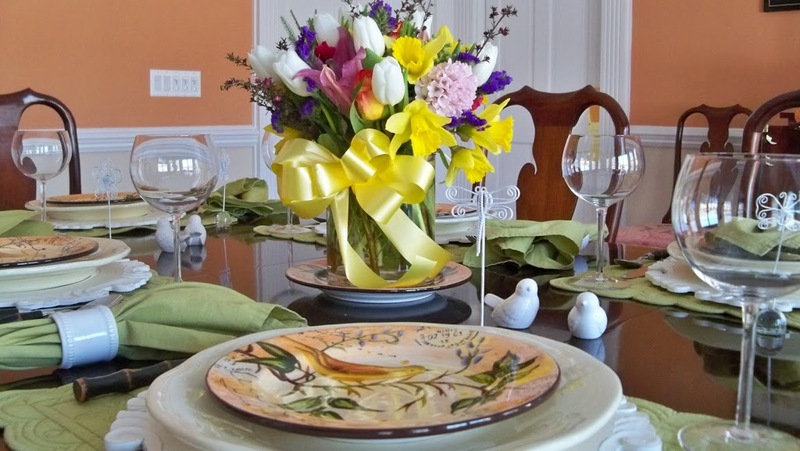 Those flowers are just spectacular, and what a great gift:@) Your table is very pretty, lovin’ your bird plates! Not as enthusiastic about the robin roosting in the wreath, one made a nest in my arbor a couple years ago and I was dive bombed/attacked for weeks! 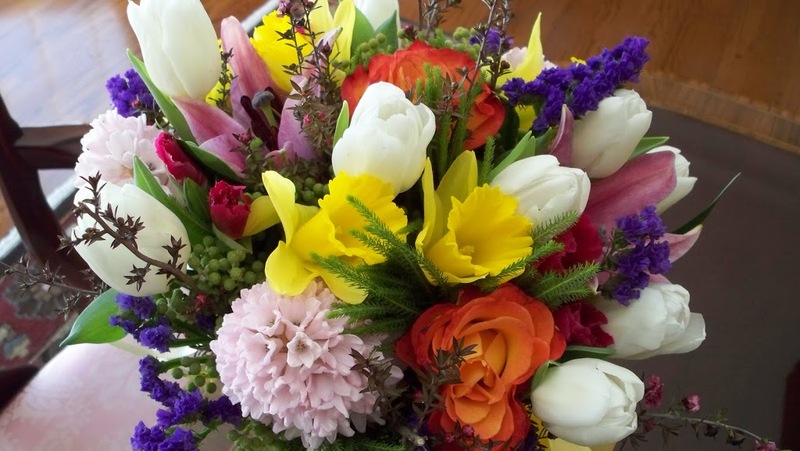 I love the beautiful bouquet! It really says spring along with your pretty china. Robins do pick the funniest places to nest sometimes. 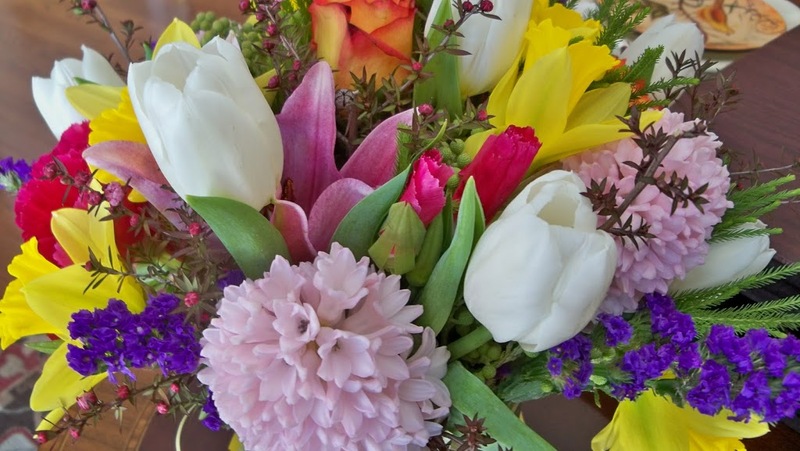 Oh, I know you were tickled to find that beautiful thank-you bouquet from your young guests! The table you set around it really does spell SPRING! 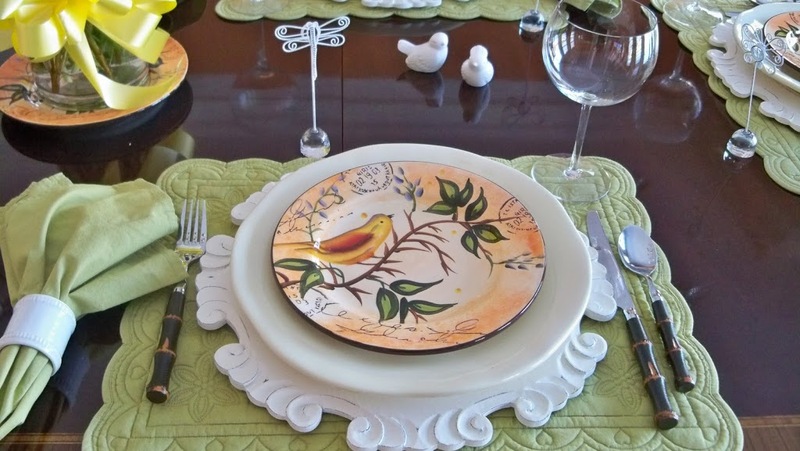 What pretty birds on the plates — and they look great with the green placemats. Thanks for visiting my table this week! Gorgeous bouquet! So colorful. Love that table. Looks like Spring inside, anyway! Those birdie plates are so pretty! What a thoughtful gesture! 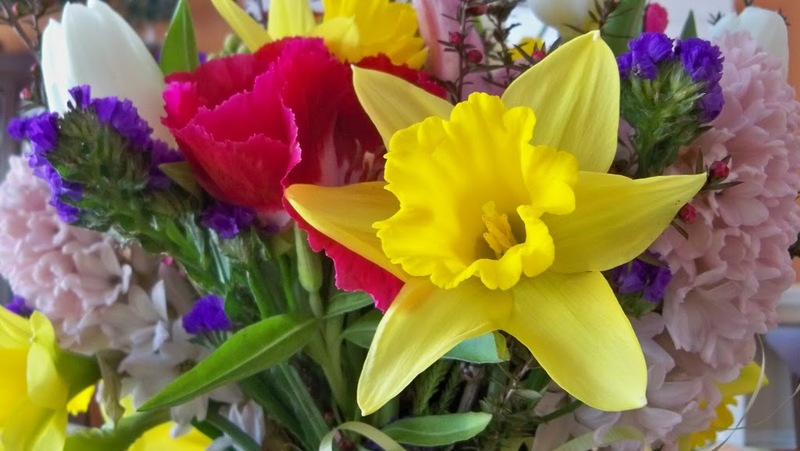 I would love to join you at your spring table – so cheerful. We had an additional 10 inches of snow last Friday, and then 40 degrees and 2 inches of rain on Monday. Equals flooding. I am ready for some Spring! Yea for Spring! 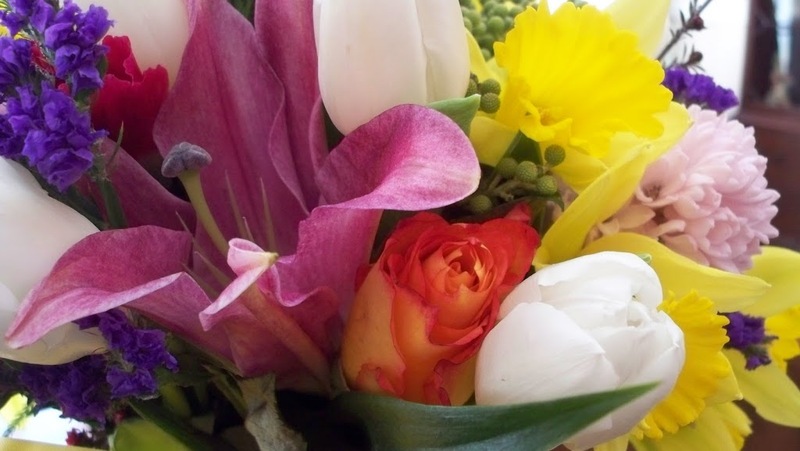 YOur bouquet is Spring Spring Spring!!!! 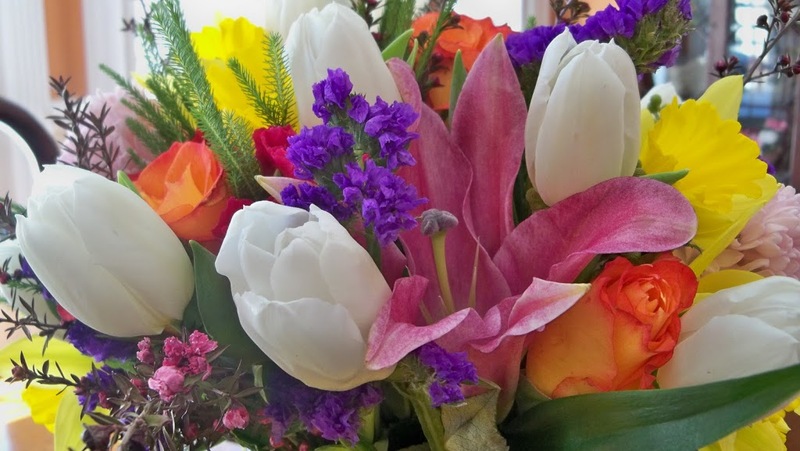 I love the many kinds of flowers that make this bouquet so lush! And Of course using it as a centerpiece is just perfection! Your plates are so pretty and unique! ANd I LOVE the color of those green placemats and napkins. Talk about Spring green! The weather here is cold and windy, but I am thinking Spring, inspired by your sunny post! Ooh we shop at the same place.. I saw those plates and let me they are sooo beautiful. I love your chargers too (we have the same taste). Your flowers are very beautiful. Your table says spring for sure! It’s beautiful. How nice of your kids’ friends’ to send you those gorgeous flowers! Just beautiful with those lovely bird plates! Glad you are feeling better, this winter has been a tough one. I would love to pull up a chair at your beautiful table!! We are under the same pile of snow up here in upstate NY…sharing your thoughts of spring is greatly appreciated! 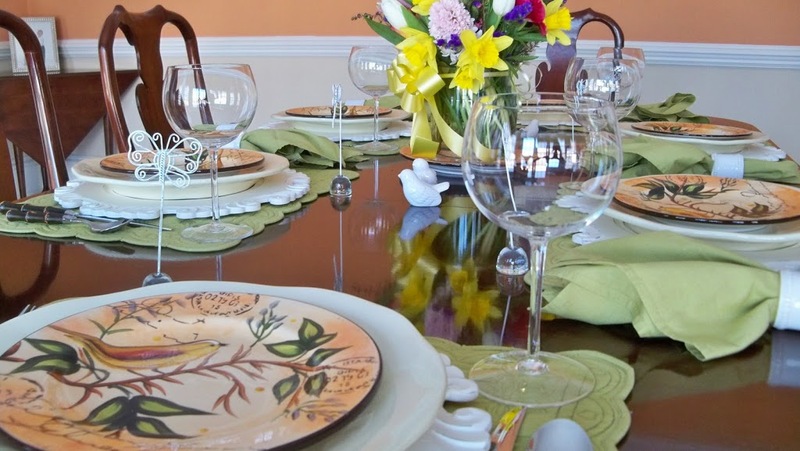 Your flowers are beautiful and they go well with your pretty bird plates. We’ll be hearing real birds soon! Your flowers are just gorgeous and I can tell by what is in the bouquet that is smells wonderful too. What a treat and a delightful thing for the kids to do to show their appreciation. What a pretty table! love those plates and the flowers are just beautiful! Oh those beautiful flowers! 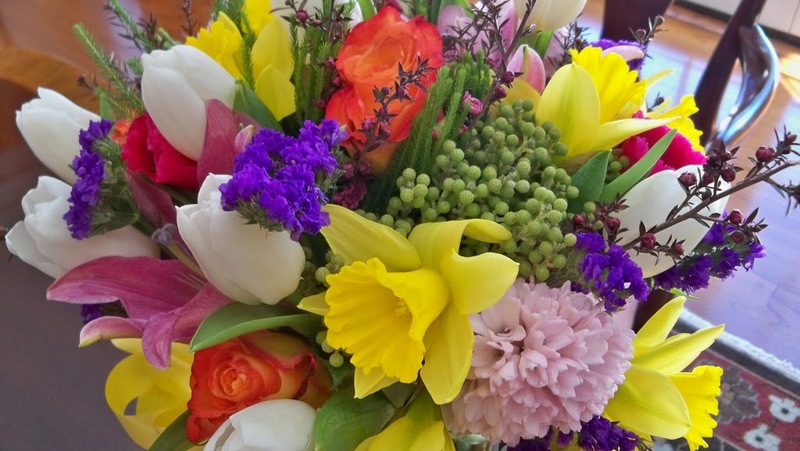 A lovely spring bouquet! 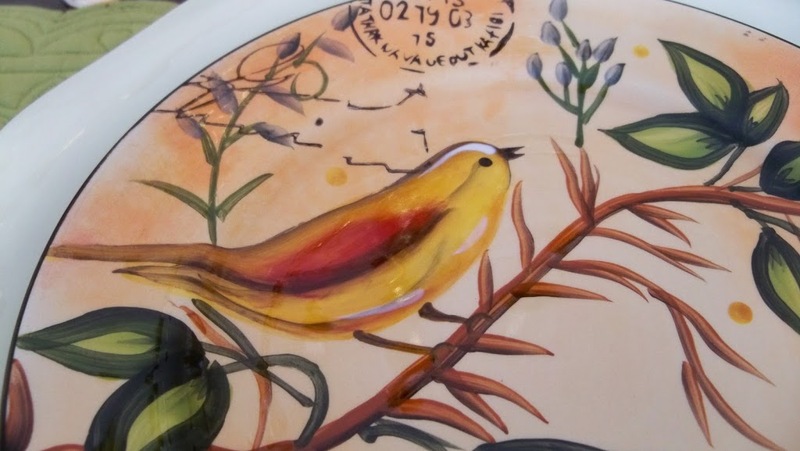 Love your birdie dishes too. What a magnificent bouquet. How thoughtful of them to send it. It brings your entire table to life. I’d love to have you join us at Seasonal Sundays this week. Oh, my gosh…when you said “buried” in crusty snow, you really meant BURIED!!! What is that…about 2 feet deep??!?!!! Yikes! It has warmed quite a bit here, and there is almost nothing on the ground now. I hope we’ve seen the last of the white stuff here…and where you are!!! 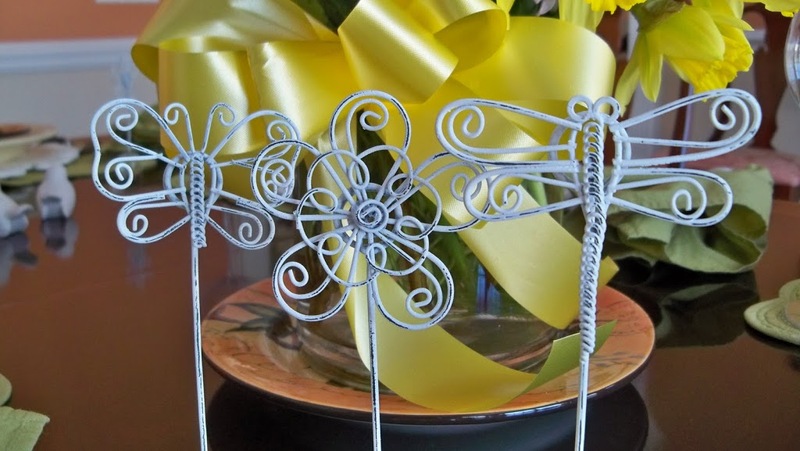 Your table is beatiful and especially so because of the love that’s there in the form of a gorgeous centerpiece! The flowers are stunning! I really like the cut of your placemats, too. The scalloping really makes them stand out. Have a wonderful weekend, and I hope sunshine and blue skies are headed your way! I like your writing style……makes me feel as if I know you. The floral centerpiece is beyond beautiful and it was so thoughtful for the “kids” to send it to you. However, I am certain that you were the perfect hostess and they had to show their appreciation. Your plates that you bought for “song” are lovely. The flowers are beautiful and I love, love, love the bird china! Hope Spring comes your way soon! Forgot to mention the bird’s nest with the spectacular blue eggs. What a treasure! Those are the cutest bird plates! Don’t you just love when kids suprise you! Your flowers are beautiful! You set a very pretty table. I love your bird plates. Thank you for stopping by and seeing my evil squirrels. Don’t you just love when the kids think of you like that? The flowers are gorgeous! And yes, they made a lovely centerpiece for that “spring” table. The bird plates are magnificent!! I miss my Orioles…they nested in the tree in our front yard where we use to live and remember in the summertime at midnight and the male, he would just sing his heart out for hours. It was like he was singing a lullaby just for me! What great kids!!!! 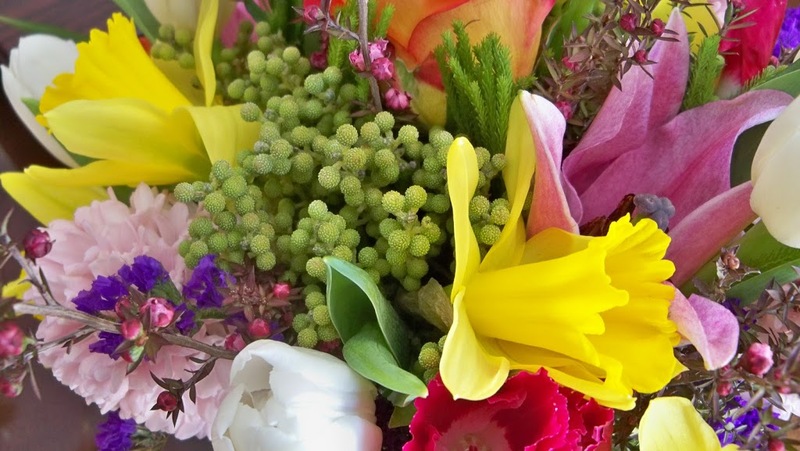 Your floral centerpiece does look like the hope of spring on your table. Thanks so much for sharing. Beautiful flowers! How wonderful..and kind of them to send you those. I love the plates with the birds. Attractive tablescape! 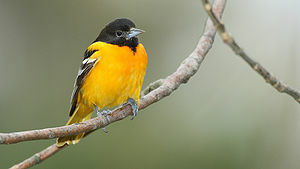 By the way Baltimore Orioles like to nest very high in trees…They love my bird bath but they are very wary. They are striking and I always get excited to see them. I too have a lot of snow to get rid of..we are in northern Michigan. Thanks for stopping by my blog! Your tablescape is lovely. I too can’t wait for spring! Wow! What a lovely thank you from “the kids!” I, too, have been fighting a cold and have not had any energy whatsoever to post anything on my blog. But I couldn’t miss your tablescape! 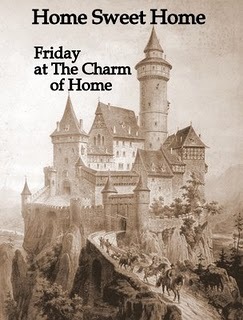 Everything is lovely, as usual, and I just get such a kick of your calling your husband Mr. Fun. You never fail to make me smile! Beautiful tablescape. Of course I love the frsh flowers the the darling birds. So cheerful. Oh! What a VERY pretty bouquet! Your table is so pretty. I hope your feeling better! A truly beautiful post Linda! The flowers are so stunning, what a nice gift from the kids! And your table, oh so pretty! I love those sweet plates! We’re wishing for spring here too. The snow is hardly budging. I wish I had a super big blow dryer that would help melt some of it. Hi. Thanks for visiting and leaving your kind comment. I just love those college kids and miss those days. Our daughters both got married last year. What a beautiful spring bouquet. I’m also anxiously waiting for spring. We had the joy of visiting New England this past fall and stayed in Coventry, CT. We loved New England. You live in such a beautiful part of the country. Your bouquet is just gorgeous the colours so fresh and vibrant, what thoughtful kids you have. Your tablescape is lovely, if there is still a free seat I’d love to stay and chat for a while, I’ll even bring my own book of birds so we can compare notes. And, you are right…if we tried to save everything, we would become hoarders and…. PS– I’m following you back! How beautiful and so sweet that your kids sent it! Your chargers are fantastic. I don’t know my birds real well, so I won’t get into the debate! Have a great weekend. That is a fabulous spring table! I love the flowers, they are beautiful! I also love your plates and chargers. Such a pretty setting. 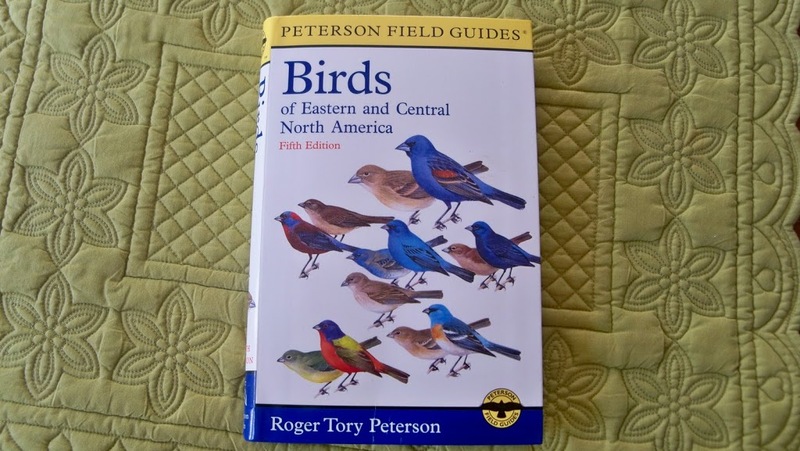 I have that bird book too. It is really good. I’ll send some sunshine your way so the snow will melt. Thanks for linking up! 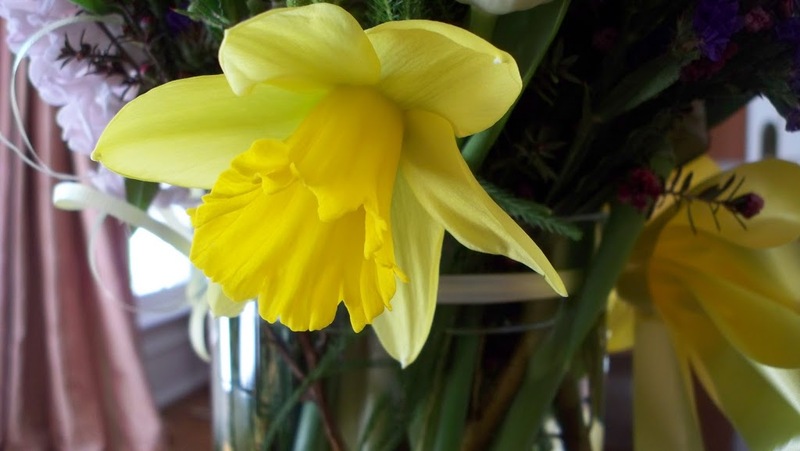 Having the flowers as an inspiration is a great way to start a tablescape….lucky you. I especially like the bird plates which are playful and fun. Hang in there, spring is on its way. 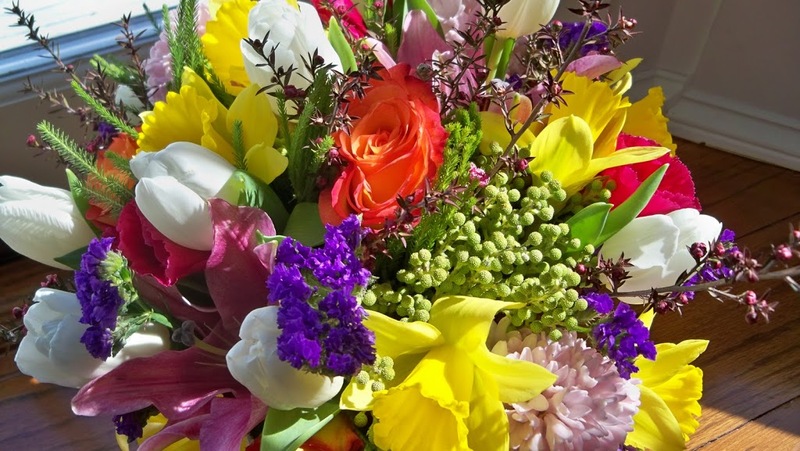 What a gorgeous spring bouquet. Good for the kids! 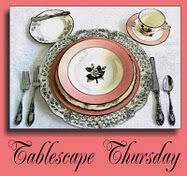 I love your tablescape with such pretty bird plates, your chargers are perfect, the whole thing is stunning! You crack me up with the Mr. fun…so nice to have a fun hubby! I’m your newest follower, hope you visit me, I’ll be thrilled! You ask if I would like to join you? No, I would LOVE to join you! Those flowers are absolutely breathtaking. How sweet and thoughtful. My daughter is also in college so around the same age. Her friends are just as sweet and actually seem to be OK with me joining them for a night on the town. As for the bird plates, I love anything with a bird motif. If you have a plate with a magpie, please reserve that place at the table for me! Oh my, thank you so much for your following, you’re so kind! I will always check all you do to keep visiting you Linda. Also thank you for your lovely comments, I’m always very grateful and humble. Have a nice weekend and hopefully the weather starts to get warm at your neck of the woods. Glad you are feeling better. 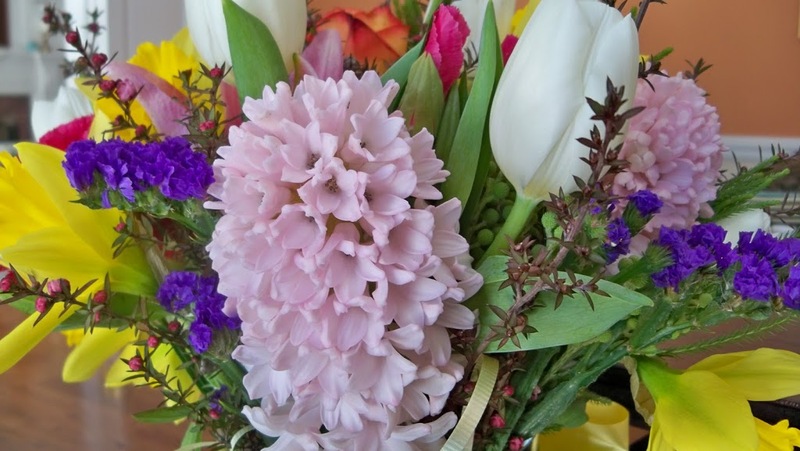 So sweet of the “young adults” to send you those beautiful flowers…really pretty arrangement! 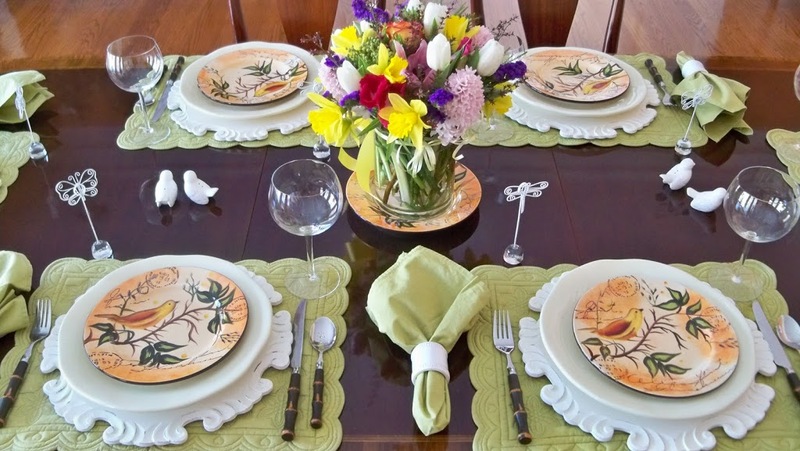 Your tablescape looks so Spring”y”…I’m so ready for warm weather and BLOOMS! Have a wonderful weekend! What wonderful kids! Sorry you were feeling awful though while they were there. The flowers just sing to me and though the snow has melted, it is ugly and brown and chilly here and I can’t wait! Love the chargers, they are my new favorite too. They really pop. What a fun table. I can smell those beautiful flowers and your pictures are gorgeous. How sweet of them to buy you the flowers! Spring is near, thanks for sharing this preview with us. Thanks for coming by my blog, and for your sweet comments. These flowers are just gorgeous! My daughter is in her first yr of college too. Love how you called your hubby Mr Fun! I’m not telling my hubby he is Mr Teacup! lol I’ll be back to visit! Have a great week. Linda, hope you are able to cut some of your own flowers soon! 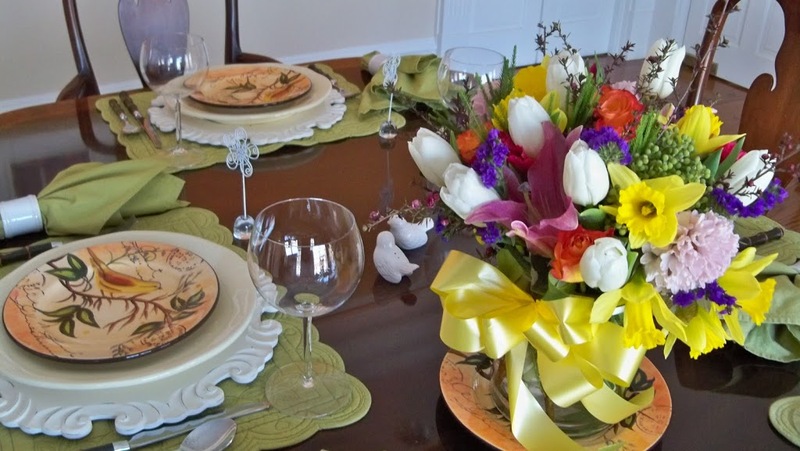 What a beautiful bouquet & tablescape! Yes, I think we’re ALL ready for Spring this year. What a crazy winter! Whenever I see spring flowers it takes me back to my days as a florist. That’s not necessarily a good thing, haha. But I still enjoy spring flowers. Nowadays, I think I’ll just paint pictures of them, not do any arranging! 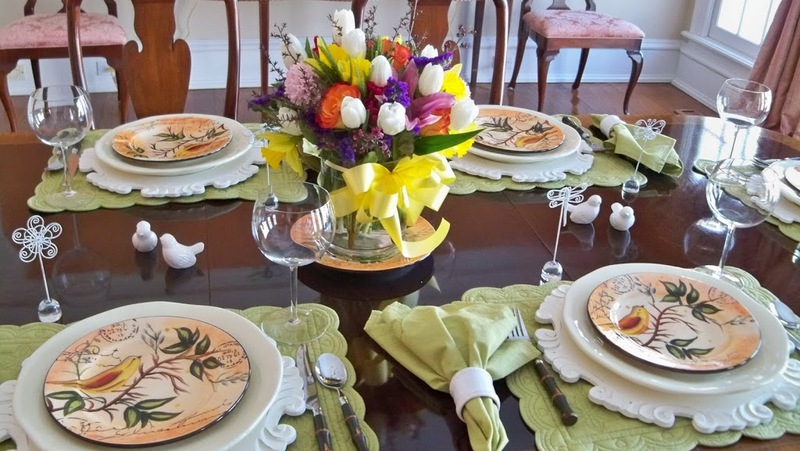 A breath of spring – I love this tablescape and the flowers are a true inspiration. I have similar dishes in blue – don’t you just love them! Your chargers are striking. A true standout. 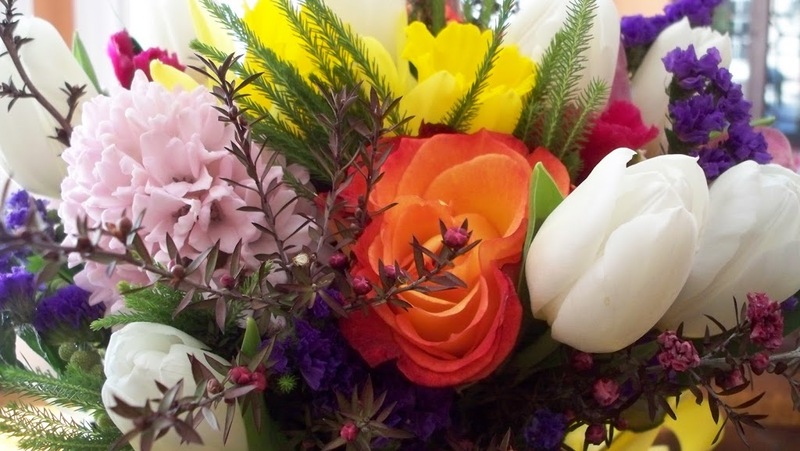 Your bouquet is amazingly vibrant, love it! LOVE those plates! And that is one fabulous bouquet!